A call on the Government to change its attitude to what constitutes a native tree has come from Crann, the voluntary organisation which aims to increase awareness of trees and woodlands. Crann Director, Diarmuid McAree, said that, in the year of The Gathering, it was time to welcome back home the tree natives that had been banished from the island of Ireland by the ice ages. “These were trees that were driven to extinction on this island,” he said. “They are now looked down upon as being somehow inferior in status to the other tree species that are regarded as native. “In the interests of biodiversity, we are calling on the Department of Arts, Heritage and the Gaeltacht to widen its concept of native trees to embrace these ‘previous’ natives. Until there is a change in official outlook on this issue, Ireland will remain on the list of relatively impoverished countries in terms of biodiversity. National Biodiversity Week (18th – 26th May) is an apt occasion for a robust discussion on this important issue. “Ireland has just 24 native tree species,” he said. “Western Europe is somewhat more biodiverse with about 100 natives, but it is still very far behind North America with its estimated 1,000 species. In the geological period immediately before the ice ages, Ireland had a much greater diversity of tree species, said Mr McAree. These included fir, maple, sweet chestnut, swamp cypress, beech, walnut, tulip tree, sweetgum, sourgum, pines, spruce, Japanese umbrella pine, wingnut, redwood and hemlock (Source: ‘The late Tertiary landscapes of western Ireland’ by Pete Coxon, Department of Geography, Trinity College Dublin http://www.ucd.ie/gsi/pdf/38-2/tertiary.pdf ). 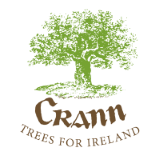 Crann, a registered charity, was founded in 1986 with the aim of Releafing Ireland. It is one of Ireland’s leading voluntary tree organisations and is dedicated to planting, promoting, protecting and increasing awareness of trees. Oak Glen is a joint Crann-Coillte project to re-establish an oak forest in the valley of Glencree.